Education when you can’t trust the Internet! This short video is designed to prompt discussion when teachers are focused on PD (professional development). Although there is strong overlap between teaching and education as concepts, it makes a distinction really worth exploring. Or are you an Educator? It has a provocative quote from Henry Brougham, First Baron Brougham and Vaux. In a speech to the British House of Commons (January 29, 1828) he said, “Education makes a people easy to lead but difficult to drive; easy to govern but impossible to enslave”. There is a link between community development, education, and the availability of better trained educators in the Global South aka Developing World. Skilled teachers with the tools to create interactive student-centric learning environments using technology enhanced teaching methods and outcomes-based education can be directly linked to the ability of a community to develop. Giving them the freedom and capacity to become all they were meant to be. This desire to empower teachers and learners around the world is the driving motive behind our C7 project. 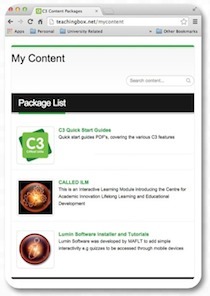 It started when we discovered the C3 Classroom Content Cloud device – a compact device specially designed to provide education cloud type services to a school or classroom with limited or no Internet connection at all. We began to use different pedagogies to develop Technology Enhanced Teaching Design (TETD) curriculum and practice. It can be summarized by adding three more C’s. We wanted to deliver to the students Challenge, Choices and Consequences. We now had C6 teaching, but there was something critical missing. We needed a core foundational truth which is fundamental to all transformative learning. Christ-centeredness is the source of true values-based teaching and learning, so there emerged a powerful new educational paradigm I’ve called C7 Teaching and Learning. Christ-centered, Challenge, Choices and Consequences, delivered on a Classroom Content Cloud. A C3 device running a Moodle and other software tools can be unplugged, thrown in a backpack and plugged in (by battery if needed) in a classroom anywhere in the world. Students can learn using their mobile devices even without the Internet. Now that is helping bridge the digital divide don’t you think?. What is possible using the C7 approach to teaching … so far! It has the conventional curriculum sharing which is the primary use of these devices in Africa and many other locations. 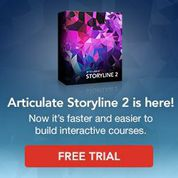 You should be able to see the content on my C3 with this URL http://teachingbox.net/mycontent How all this works is explained on the Critical Links Website. Even this file serving capability is game changing in many educational environments in the Global South (aka developing countries) How the C3 can sync with the cloud and content deployed over numerous units is very appealing to Ministries of Education (i.e. Government run Educational Management authorities). The Content Portal also has available a search function, which shows in a “Google Type” fashion, the results of keyword search in all the content stored in the various available packages. However for the teacher wanting transformational learning to happen in their students, the C3 device can empower so much more. The configuration of my C3 is only 60 gb less space for the operating system. This is the smallest capacity device. More file storage is possible. So for this unit, which is primarily for development, I have installed only the encyclopedia “Wikipedia for Schools” It is also fully indexed and searchable which is great. Wikipedia can only be accessed by users of the C3 LAN network. It is 6,000 Wikipedia articles for School children is 4.7 Gb and was created July 2013 A C3 can be as much as 240 gb at the moment but larger models are soon to be released. Therefore if you have the storage capacity you can load multiple versions of the Wikipedia Encyclopedia including the entire Wikipedia which has regular updates available. When you are on the LAN with the C3 these encyclopaedias are displayed in a specific content portal accessed by typing “wikipedia” in the user browser. 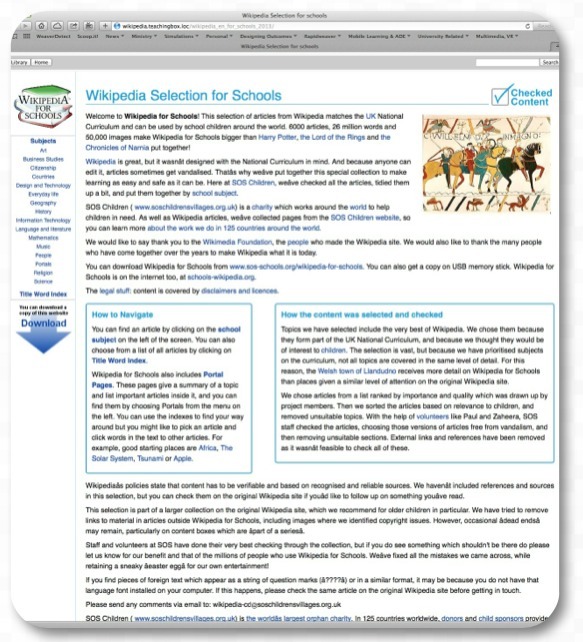 Individual encyclopedias are shown in the initial content portal, which are then loaded and available for use. This is Moodle 2.6 at the moment but will be upgraded when neccessary. I have been working on this site adding plugins and themes and focusing on video supported guidance for students. i.e. short 1 min or less webcam type video mini-clips (I call them) Instead of teasing/encouraging students with text to engage with the content I do it with a webcam spot and talk to the activity etc. What is quite unique (we developed the plugin) is that if you access the Moodle site from the internet and want to see the clip it feeds it from YouTube. If you are on the C3 Wi-Fi LAN (named teachingbox) it feeds the video from the local drive. This is a fully functional Moodle site with some powerful functionality added by plugins. I have been told it is more like a WordPress Site than a Moodle … please have a look at the Moodle Home Page and should you be interested in browsing one of the core courses of the Centre of Academic innovation, Lifelong Learning and Educational Development (CALLED) please email Allan Carrington and explain who you are and what interests you and we will send you a guest The course is called “Technology Enhanced Teaching Design”. There is no way you can adjust permissions in Moodle to give guests (no login) access to any sort of survey activity. So I wanted to make it as accessible as possible for a teacher to create questions and ask for participants (more than students) able to submit their responses and the teacher can give instant feedback. This type of scenario has been traditionally the realm of the “clicker”. Some universities have purchased thousands of these devices. We have installed on the C3 LimeSurvey an open source stand alone survey tool. 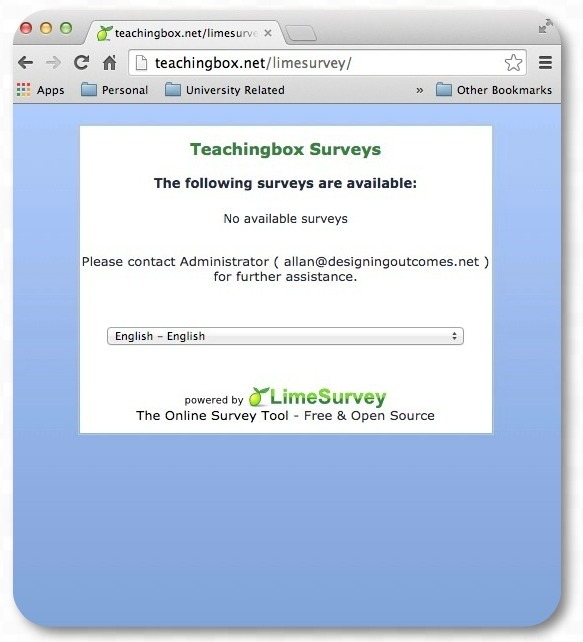 You can see the front page of this at http://teachingbox.net/limesurvey It might be slow to load but loads quickly when on the C3 teachingbox network This will enable a Teaching Box to be used to mine responses in any teaching space e.g. conference area, classroom or church etc and by using mobile devices a teacher can teach by questioning. How do you get a tweet stream happening without an internet connection. Twitter is not the number one elearning technology for the last five years for nothing. Having a way learners can ask questions make contributions give extra resources etc and it being available to all in the class is a powerful pedagogy. We achieved this for the C3 by installing text chat software, Called Blab!, it enables people on the LAN to add a name and sign in as guest and join the conversation. The data base records the messages and can be reviewed for a record of the knowledge building. 1. 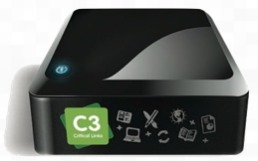 A C3 Classroom Content Cloud: is a compact device specially designed to provide education cloud type services to a school or classroom with limited or no Internet connection at all. It automatically creates a wireless local cloud in the classroom, giving local students full broadband speed access to education web sites, digital encyclopedias and local curriculum material, including ebooks and multimedia content. A cloud drive service is also part of this integrated solution, allowing users to have a private folder in the C3. This powerful small teaching box is preloaded with a Virtual Learning Environment which is a learner centred interactive platform using the popular Moodle Learning Management System. 2. An Energizer XP18000A Battery Pack: This rechargeable battery can power the C3 for about 6-8 hours depending on the server load. 3. A LAN Blocker Switch: This small simple switch in the Ethernet line from the C3 to the outer/modem enables the teacher to manage the class and remove internet access to help the learners focus on what is happening in the classroom. 4. An ASUS RT-N66U Dual Band Wireless N900 Gb Router: The C3 has WiFi built in and is only strong enough to handle about 30-50 users (students). 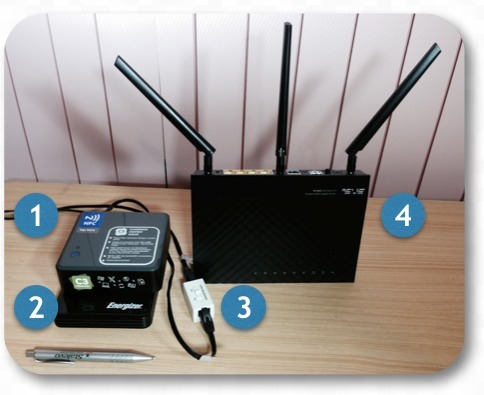 By adding this small business fast powerful WiFi Router we expect the system will be able to handle 100-150 users. This is for text based enquiries at least, in the Student Response System (Lime Survey). We are going to load-test the system to find out the upper limit of the number of people who can access the system at any one time. We are thrilled that Critical Links is prepared to accept us as a reseller of these excellent devices to help teachers deliver technology enhanced, student centric, interactive teaching to areas of the world where IT skills and Internet bandwidth are far from ideal. To find out more click on the Critical Links C3 logo which will take you to their website. Provide 2 hours free set up consultancy. Also coming soon will be screencast tutorials and a Moodle course to help teachers master the process. We will be building a community of practice with educators using this system to share ideas and best practice. Excellent Allan. It has been fun watching you design, develop, then tweak this compact but powerful educational learning system. More and more, the technology piece in education is becoming transparent to the process of learning. 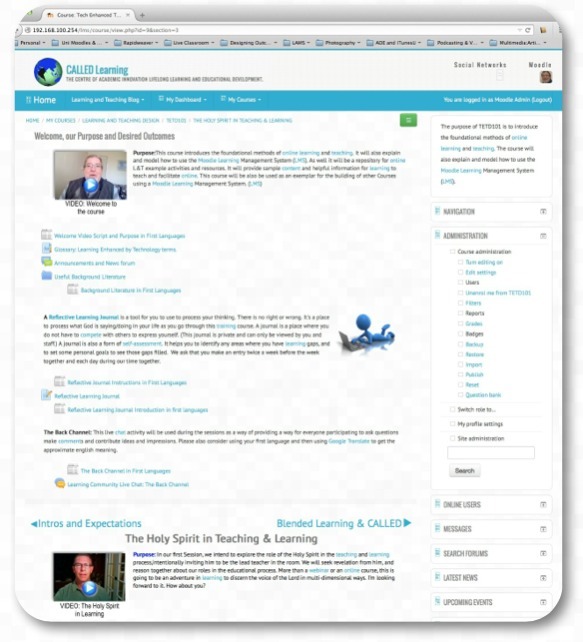 It gives a teacher a comprehensive “dashboard” to teach from. Everything you are working on is progressing and changing every day. There is truly an educational revolution taking place globally. I’ve enjoyed the many conversations with you related to this development. Thanks for letting me contribute to the process. Allan, I know you have chosen Moodle as your LMS because of several reasons, some being that it is the most used open-source LMS on the net, and that you have developed an expert use of it. Being that it does resemble WordPress, it does bring with it a bit of daunting challenge to the non-technical educator. In other words, it is not as intuitive as much of the technical experiences people global wide experience on their smartphones for example. There are other LMS's on the market, with their own limitations and powers, such as Canvas, CourseSites, Schoology, etc. I would think most new users of a system like yours described here, those who have grown up with technology, would appreciate the intuitive over the need for ongoing technical assistance. As these LMS's continue to adapt toward a "drag and drop" environment, will your C7 system be able to adapt quickly to a product that promises more ease of use? In my experience as an educator, I need to preserve time for lesson planning and design for sound classroom pedagogy. I cannot get bogged down with technical obstacles. It has to be as seamless as possible, and quick to use. What are your thoughts on this?, and I hope other practitioners like me will add their own questions and concerns on this thread. Since writing this reply and asking a few questions, I have spent a considerable amount of time researching and using the Canvas LMS. It is quite good, and very easy to use. I'm sure Moodle has many more capabilities but for ease of use, and turn key operations, it's something to consider.